Monocyte. 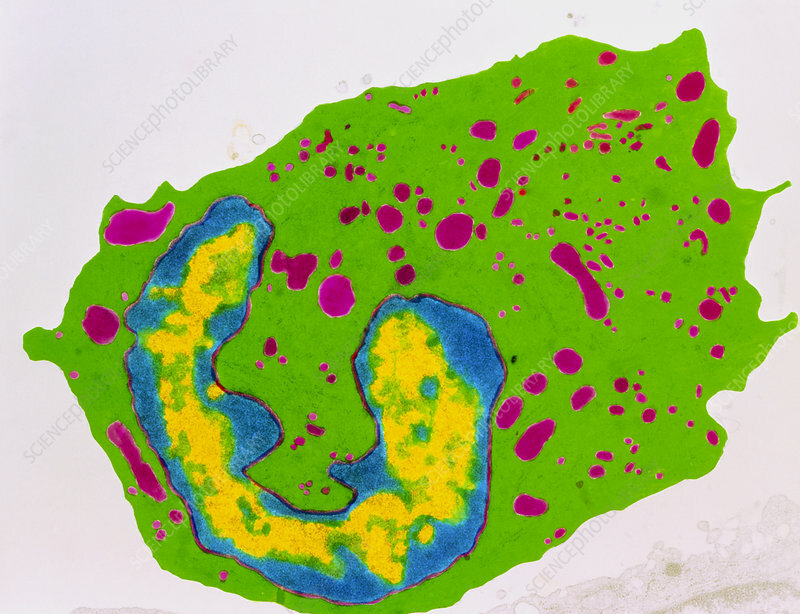 Coloured Transmission Electron Micro- graph (TEM) of a section through a human monocyte, the largest type of white blood cell. At lower left is a characteristic large horseshoe nucleus (yellow & blue). The cytoplasm is filled with small lysosomes (pink). Cytoplasmic projections occur on the cell surface, which enable the cell to be mobile. Monocytes migrate into tissues where they are known as histiocytes or macrophages. In tissues, they scavenge and engulf cellular debris and foreign micro-organisms. They play a part in the initial phase of the body's immune response. Magnification: x6600 at 6x7cm size.